The grid-based format of the nine human-scaled paintings in “Color Paintings” is becoming veteran abstract painter Pat Lipsky’s recognizable trademark structure. It places her in the company of such reductive, contemplative painters as Piet Mondrian, Mark Rothko, and Agnes Martin. Five vertical columns of varying widths are divided at points that in cross section appear as ascending and descending steps that dip down or rise up in the center. Often, three narrow columns frame two wider columns. The symmetrically deployed colors allow for myriad associations; they could be landscapes viewed through a colonnade, renaissance facades, geometric patterns, ornamental motifs, or blocky figures. In “Proust’s Sea” (2006), two central columns feature colors that recall sky and earth are framed by three columns of colors that recall earth and sea. Naming the blues, greens, umbers, and teals become a fruitless exercise because these carefully mixed hues defy a fixed identity. One is apt not to notice the mastery of color because it all seems just right. 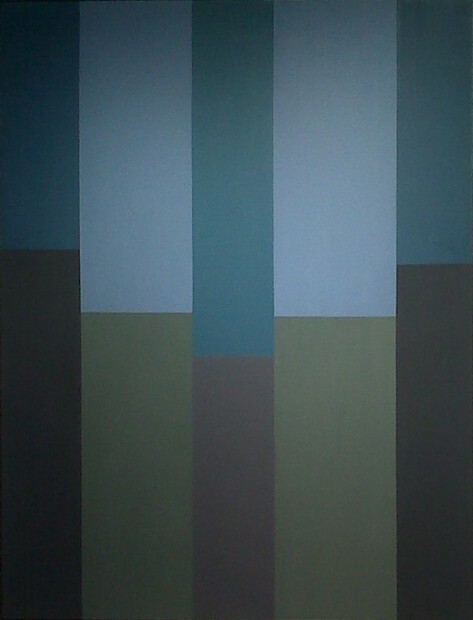 The blues, at once radiant and atmospheric, are activated by the somber tones of browns and greens. The handling of the edges adds vitality and one could become mesmerized simply following the lines, spaces, smudges, and blurs that separate the segments. The surfaces are delightfully polluted with traces of dust, hairs, and blobs of dried paint. These are hand-made paintings, and although they may make allusions to an ideal, they are full of the irregularities and imperfections of life.